Looking for fun pregnancy announcement ideas for St. Patrick’s Day? We’ve got you covered! From leprechauns to shamrocks, these clever ideas show off how the luck of the Irish helped you complete your family! St. Patrick’s Day is such a fun time of the year to share your big news. 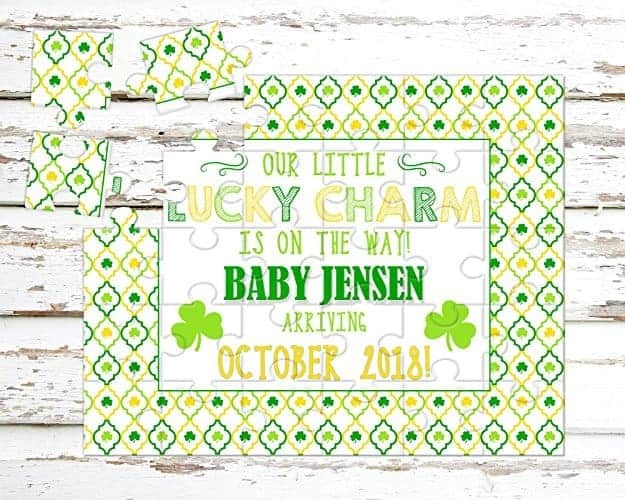 Between leprechauns, shamrocks and the luck of the Irish, you’ll never struggle to find a cool theme for your announcement. Here are some great pregnancy announcement ideas for St. Patrick’s Day. 1. Let Your Shirt Do the Talking! 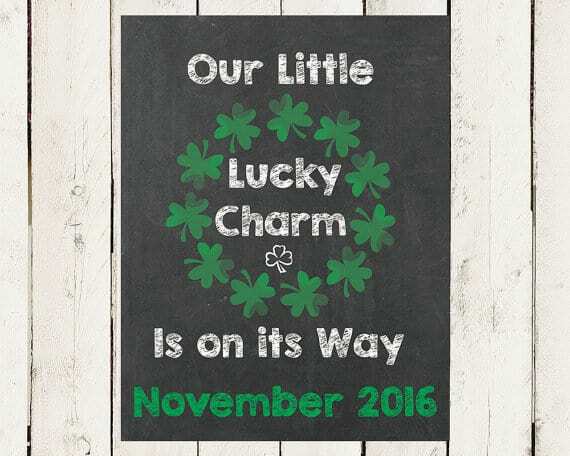 Do you have any favorite pregnancy announcement ideas for St. Patrick’s Day? Share below! Affiliate links included below. If you make a purchase through these links, we earn a small commission at no extra charge to you. Wearing a funny St. Patrick’s Day maternity t-shirt, will certainly get the message across about your pregnancy. The Etsy Shop- The Maternity Shop has a Glitter Text Irish Black Maternity Shirt, which features the text- “I Got Lucky”- with a four-leaf clover image. The t-shirt is available in your choice of short sleeve and long sleeve. Amazon has a Funny Maternity Shirt, which features a little leprechaun peeking out from a zipper on the belly! Redbubble has a cute selection too. Cafepress has a Little Leprechaun Maternity T-Shirt, which features a four-leaf clover image and the text- “Little Leprechaun.” The t-shirt is available in 5 colors: black, charcoal, coral, navy and white. 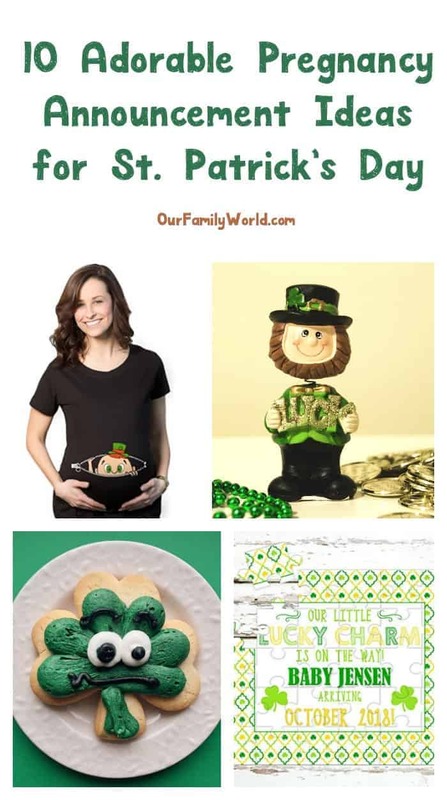 Zazzle has a Lil’ Leprechaun on Board Maternity T-Shirt, which features an image of an Irish hat and the text- “Lil’ Leprechaun on Board.” The t-shirt is available in 4 colors: black, heather grey, pink and white. ►►Looking for baby name ideas? Check these Irish inspired names. I love this fun 30-piece puzzle that I found in the handmade section on Amazon! You can have it customized with your baby’s due date. It comes broken apart, so it’s ready to give to your recipient. Bake up a batch of cookies to announce your pregnancy, like these St. Patrick’s Shamrock Cookies from Genius Kitchen. Then, using icing, write something like, “Little Lucky Charm,” or “Little Pot of Gold” on the cookies. These look super simple to personalize, don’t they? Filling a St. Patrick’s Day party favor container with baby items is one of the most unique ways to announce your pregnancy. Party City has a cute Pot of Gold Green Cauldron, while Oriental Trading features a Gold Candy Bucket with Ribbon Handle. Fill the containers with small baby items, like a onesie, baby rattle, pacifier, baby bib and/or diaper cream. If you’ve already had an ultrasound, this is a fun way to tell the world! It’s easy enough to make on your own with black paper and a little creative lettering, or order one from Etsy. These are just a few clever St. Patrick’s Day pregnancy announcement ideas. There are so many directions you can go in with a little imagination! If you’re having a rainbow baby, St. Patrick’s Day is an even better time to announce it! Either way, your bundle of joy is better than all the pots of gold waiting at the end of all the rainbows in the world! Congratulations! Awesome Family Movies for Action Lovers! Using that ultrasound result looks amazing. Love it. Great ideas overall indeed! These announcements are so cute. I really love the one with the baby peaking out of the shirt. It’s so funny. What a cute and fun ideas. This would be really perfect for soon to be mom 🙂 I have to share this with my friends. they will love this for sure. I love the ultra-sound cards. Anyone is lucky to have such a beautiful baby! Awe, the little zipper one is so cute! My Irish parents would just love that one! That 1st t-shirt is cool looking, but a little creepy at the same time. I think I’d go with one of the other suggestions! So cute! I love these ideas. People are so creative these days with pregnancy announcements and gender reveals.